My project centers on the characterization of a novel mitotic spindle-associated protein called astrin. 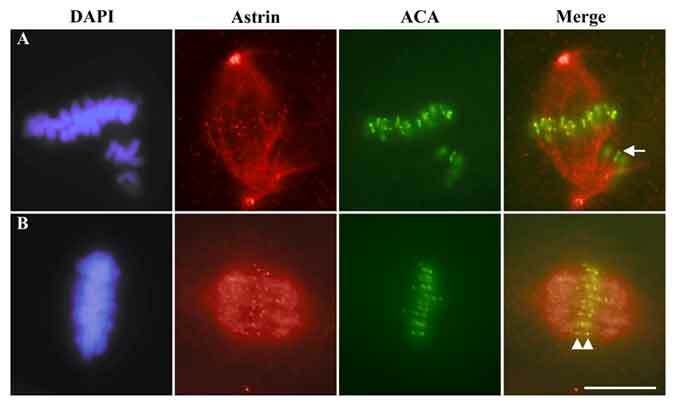 Astrin was identified in our lab by mass spectrometry as a novel high molecular weight protein that was enriched in purified mitotic asters (Mack. G. J. and Compton, D.A. Proc. Natl. Acad. Sci. USA, 2001. 10:1073). Antibodies raised against astrin have revealed that it associates with microtubules at prophase where it concentrates at the spindle poles. 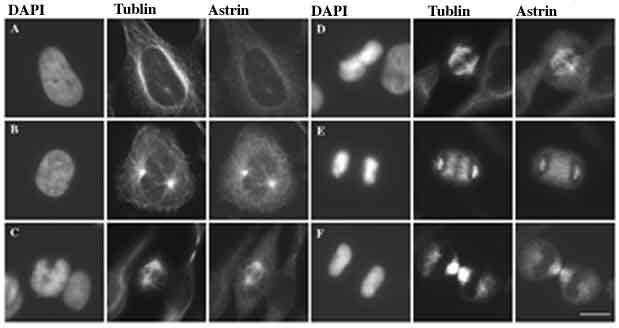 Astrin localizes throughout the spindle in metaphase and anaphase and associates with mid-zone microtubules in anaphase and telophase. Furthermore, astrin also localizes to kinetochores, but only on those chromosomes that have congressed. At this time the function of astrin remains unknown. 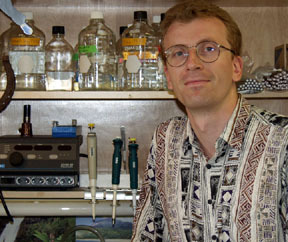 However, I am currently using a multi-technique approach including biochemical purification, antibody microinjection and RNA interference to determine the role of astrin during cell division. HeLa cells were fixed in cold methanol and stained with antibodies against astrin, tubulin, and the DNA-specific dye DAPI as indicated. Cells were classified as in interphase (A), prophase (B), prometaphase (C), metaphase (D), anaphase (E), and telophase (E) based on the morphology and alignment of chromosomes and spindle organization. Bar,10 mm. CFPAC-1 cells were fixed in glutaraldehyde and stained with antibodies against astrin, anti-centromere antibodies (ACA), and the DNA-specific dye DAPI as indicated. Cells were classified as in prometaphase (A) and metaphase (B) based on chromosome alignment. Arrowheads highlight sister kinetochores in metaphase that stain for astrin and the arrow highlights the kinetochore of an unaligned chromosome in prometaphase that lacks astrin staining. Bar,10 mm. 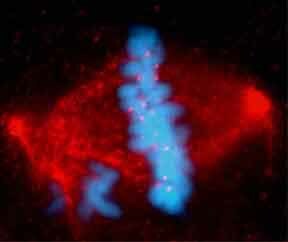 A prometaphase CFPAC-1 cell was stained with an antibody to astrin (red) and the DNA-specifc dye DAPI (blue) and the channels merged into a single image.